A properly sized basketball rim is integral to the play of the game. When a shot makes its way through the rim, the shooting team scores points based on where the shot came from on the court. Consistent measurements are used for basketball rims across all levels of play and between genders. To help visualize a shot going into the rim, an interwoven net is added. A basketball hoop is circular in shape and has an inside diameter of exactly 18 inches from edge to edge. These 18 inches should be consistent from all point-to-point measurements that cross the exact center of the hoop. The metal hoop should also contain harness hooks to secure the net. The measurement from the floor to the top of the rim should be exactly 10 feet. There should be 6 inches of separation from the ring to the basket. 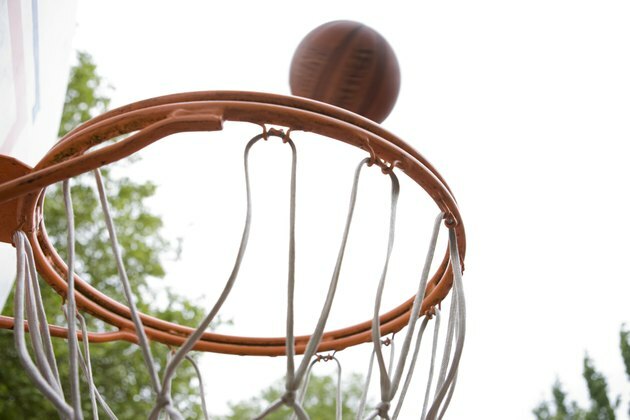 The side that attaches to the basket should have a rectangular piece of solid steel to ensure that there is no separation from the backboard to the rim. This piece of steel should sit flush with the backboard and is considered part of the rim. A net should be fastened to the rim to allow for visual recognition of a made basket. The NBA rulebook states that the net should hang between 15 and 18 inches in length. The thread count of the netting should be over 30 but less than 120 total threads. There are normally nine attachment hooks for the net to be secured to the rim. The rim should be secured to the backboard using a bracer support system. The rectangular piece of the top of the rim will have a square faceplate set at a perpendicular angle attached to it. Each hole of the four-corner faceplate should line up with the holes in the backboard. The rim assembly is then fastened to the board by screwing in four bolts that are secured with washers and nuts. Upon securing the rim to the backboard, a level should be used to ensure that the rim is perfectly parallel to the floor. Sanctioned basketball games at the professional and collegiate level require certain safety features of the rim be met. The rim and hoop assembly should have some flexibility and be able to slightly flex to the front and side according to section 14, article 3 of the NCAA handbook. These rings should also be able to absorb at least 35 to 50 percent of the rebounding elasticity of a shot.